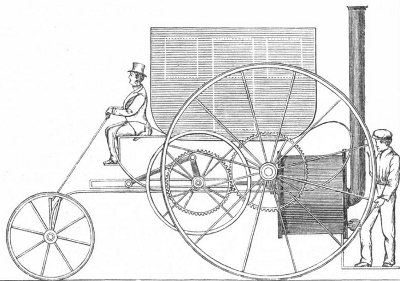 The first “horseless carriage” to be demonstrated in London was constructed by Richard Trevithick in 1803. It was designed as a passenger vehicle and averaged between 4 to 9 mph (6.5 to 14.5km), similar to a trotting horse. While the propulsion system seemed to be fine, and perhaps could have been improved for greater speeds, not enough thought was put into the steering or brakes and the vehicle crashed on its second run. This frightened the public who felt such devices should be put on set paths, as in the rail road. 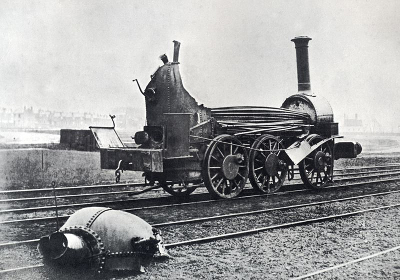 Trevithick led the way with the first full scale working railway steam locomotive, on 21 February 1804. So it was, when people spoke of locomotion, they were generally referring to trains. A great boom in rail transport began and competitions for the fastest steam engines were held annually. By 1825 various companies had trains reaching 24 mph (38.5 km), and by 1830 the Liverpool & Manchester Railway’s Rocket (while averaging 17 mph/27 km) reached 30 mph (48 km). In the late 1820s an inventor named Goldsworthy Gurney designed and built steam-powered vehicles for commercial road use, and opened the Gurney Steam Carriage Company. He ran a service between London and Bath, his carriage averaging 14 mph, with a top speed of 20 mph (32 km). However, high tolls were unfairly charged on the turnpike roads, and the railways soon put him out of business. An example of his machine can be viewed at the Glasgow Museum of Transport. Gurney went on to create a multitude of other inventions and was knighted in 1863. Railways were stretching all over England, Europe, and America. By 1850 the fastest train was topping 80 mph (129 km). There were dangers involved, with boiler explosions and derailments claiming many lives. During the early Victorian era steam launches were becoming increasingly popular, with speeds of about 15 knots (17 mph). Man no longer needed to rely solely on the wind to travel over water. At first the inventors used the water-wheel to propel the boats, and they were known as paddle-steamers or paddle-wheelers, sometimes driven by a rear wheel, sometimes with side wheels. They grew to quite large proportions and saw the greatest use on the world’s large rivers, but many were built as ocean-going vessels. The largest paddle-steamer ever built was Isambard Kingdom Brunel’s Great Eastern, launched 31 January 1858, but it also had screw propulsion and sails. The craft was 692 ft (211 m) long and weighed 32,000 tons, with paddle-wheels 56 ft (17 m) in diameter, but its top speed was only 14 knots. It was around this time that inventors realized a rear screw could propel a boat much faster than wheels. They reached greater and greater speeds throughout the Victorian era, the swiftest steam boat being Charles R. Flint’s twin-screw yacht Arrow, which managed a nautical mile in ninety-two seconds, or 39.24 knots (44.13 mph) in 1902. S.H. 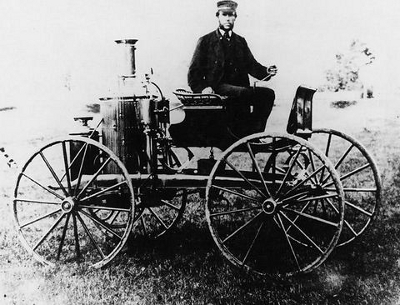 Roper and his steam carriage, 1863. Sylvester H. Roper was an inventor from Roxbury, Boston, Massachusetts. In 1863 he built his first steam carriage. Then between 1867 and 1869 built a steam velocipede (motorcycle). He died in 1896 (aged 72) while demonstrating his 1884 model that could do 40 mph (65 km). Trivia: Did you know that pneumatic tyres weren’t invented by J.B. Dunlop for bicycles in the 1880s? They were originally patented by R.W. Thomson in 1846. Amazing how far we have come. 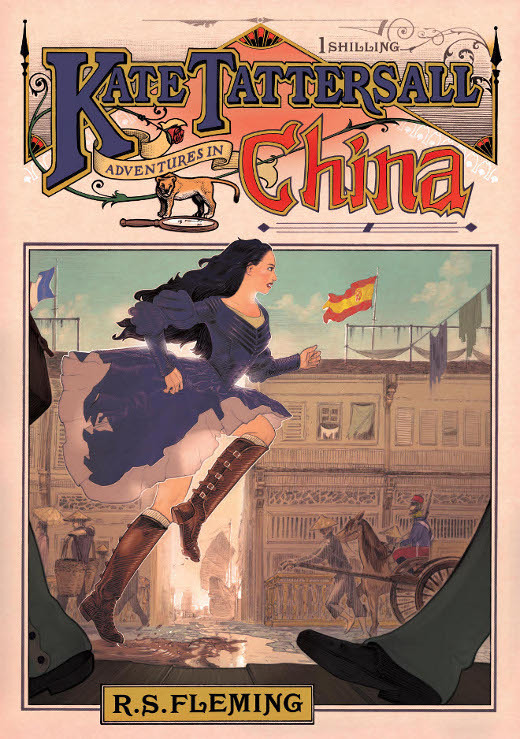 Kate’s Adventures really are amazing. The first working steam powered vehicle was likely designed by Ferdinand Verbiest, a Flemish member of a Jesuit mission in China around 1672. I had no idea they had vehicles like this in the 1800s. Wow! Very good site. Tons of terrific steam power information here. I would love to build a steam-powered car. A small roadster for summertime. Thank you for this info. I would like a website with all these inventions/blueprints/drawings to build my own machines. There’s a lot to be said for making stuff by hand. I think we are losing these skills. Thank yoᥙ for a very informative web site.